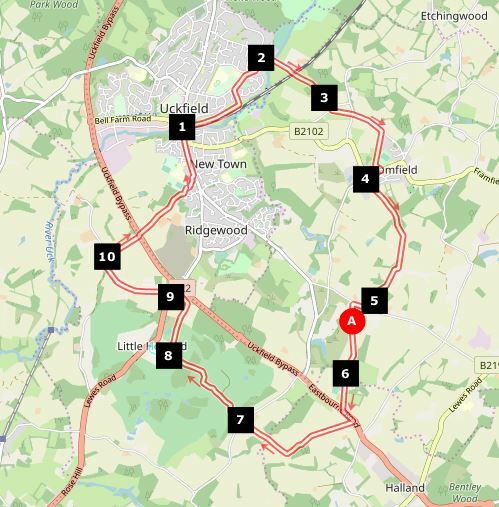 A 9 mile ramble through the undulating low Weald Countryside from Uckfield, featuring the footpath which was the cause of the famous battle between the Ramblers and Mr Van Hoogstraaten. Various shorter alternatives. You need not worry. There has been no history of any problem with the famous path for many years. TQ474209, The junction of Uckfield High Street and the entrance to the Supermarket care park, immediately north of Uckfield railway station. Little Horsted bus stop or Uckfield railway station. A regular service runs seven days a week to Uckfield bus station from Lewes (number 29). All buses also stop at Little Horsted bus stop. On Mondays to Saturdays there is a service from Uckfield to Framfield. 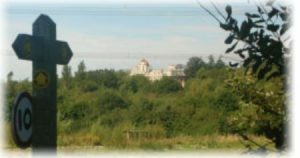 On Mondays to Saturdays the Eastbourne to Uckfield bus stops near Crockstead Farm, at Knowle Lane on the A22, at a point about 100 metres further east from the point at which the path leavest the A22. This stop is also served by buses from Brighton and Lewes to Uckfield on Sundays. To get to the start of the walk from the bus station walk back the way the bus came until you reach the high street. Cross the high street at the crossing and turn right. The start is at the next junction on the left. This walk goes through varied scenery and gives you the chance to look at a various ways that the countryside is changing in the modern world. 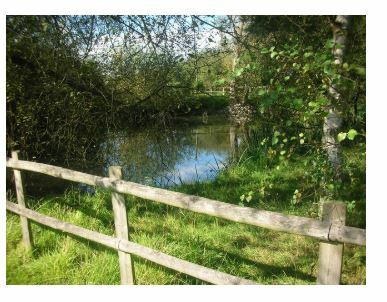 A child friendly out and back walk from Uckfield to Hempstead Wood and the Horse rescue centre. Starting at Framfield, which takes about two and a half miles off of the total. Finishing at Little Horsted bus stop, which takes about 2 miles off of the walk. The full walk has 200 metres of ascent. There are quite a few stiles, although they were nearly all in good condition when the walk was researched. Chilli Peppers Cafe Bistro, Olives Yard, High Street. The Maiden’s Head, 91 High Street. The Civic Centre, Civic Approach. The snack bar at Lower Horsted golf course has toilets intended for customers. 1) At the start you will see a footpath sign pointing east. Follow the route east, staying on the south side of the supermarket car park, next to the railway line. At the end of the car park enter the Hempstead nature reserve and follow the path ahead as it winds through the reserve. 2) Come to a recreation ground. Turn left and head upwards towards the children’s playground (A) Pass by the left hand side of the playground and come to a track. Turn right along this. The track crosses a road and then turns into a small tarmaced road itself. 3) Keep straight ahead on this road until it turns right at Browns Path. Turn right with the lane and then keep straight ahead. 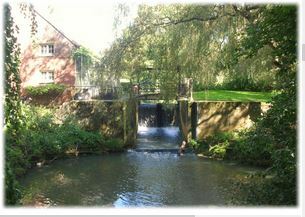 Cross a stream and notice an attractive weir and old mill on your left. Pass the Sussex Horse rescue centre on your left. This has open days in the summer and would make a good destination for a short out and back walk. Cross the railway line, watching out carefully for trains. Pass by Hempstead Wood (B) on your left. This is a wonderfully dark and mysterious wood and would also make a good short walk destination. There are lots of trees to be climbed and adventures to be had. The main walk keeps straight ahead, ignoring the paths to the left, and reaches a small road. 4) Turn right here along the road and then left along another road after about 10 metres. Follow this road to a crossroads. Keep straight ahead here (signposted to Framelle Mount). Pass a large house on your left with a footpath sign pointing up its drive and then look out for an old footpath sign just before a house on your right. Your way is right here. 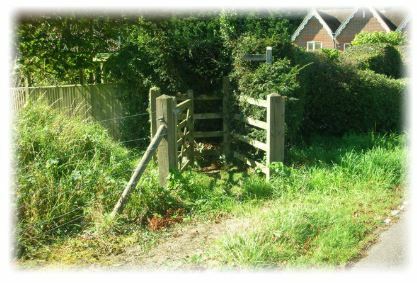 There is a metal gate and you can see a stile ahead. Not so easy to find is the stile you now have to climb, which is to the right of the gate, hidden by a hedge. Cross the second stile. The path now heads for the left hand corner of the field. Just before the end is a stile on your left. Cross this and then turn slightly right, to continue travelling in the direction you were going before the stile. At the end of the next field the path turns left and then passes the recreation ground. It then turns right through the car park to reach the road in Framfield. Turn right along the road and walk, past the post office, to the Hare and Hounds pub. This is an unspoilt local pub that serves food at lunchtimes. (D) Framfield is an attractive old village with a small suburban development. 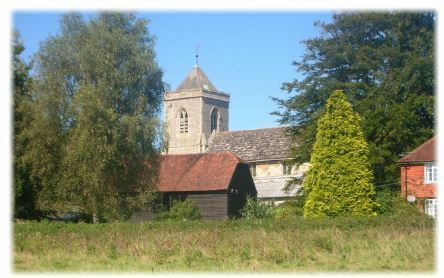 The church is particularly attractive. 5) At the pub turn left, heading past some very attractive houses towards the church. Enter the churchyard and take the path to the left. At the vicarage follow the path to the left again. Come to a junction and go through a metal gate to the right. There is another gate ahead, but do not go through this. Instead take a path to the left, along the edge of the field. In 2014 this was fenced off from the field. Keep straight ahead, going south east along the edge of the field Enter a wood. Emerge from the wood. The path turns left, uphill along the sid of the wood. At the next hedge on the right turn right, keeping the hedge on your right. There are a number of paths across this field. You need the right hand one, which runs next to the hedge line (In 2014 there were a number of temporary fences across this field. There were stiles or gates at each fence, but these were to the left of the right of way. It is up to you what route you take but you want to end up in the far right hand corner of the field. Near the corner of the field see a small stile. Cross this, enter the wood and turn right, following a clear path. This shortly reaches another stile. Cross this and head straight ahead on a broad path next to a beech hedge. Meet the drive of Arches Manor and turn right along it, away from the house. Arches Manor is typical of a development that has been going on in Sussex for many years. Large houses dot the landscape housing affluent people who may not have any close connection with the land. Notice that they are conscientious about keeping the rights of way on their land clear, whilst maintaining their privacy. 6) At the end of the drive reach a pair of rather intimidating gates. There is a metal stile to the right which you climb over. Turn right when you reach the road. Pass an attractive older house on the right and a stile on your left. Come to a path on you left which enters a small field by means of a gate. Walk along the clear path ahead. E) This is it. This is the path all the fuss was about. This is the path that Nicholas Van Hoogstraten (or, strictly speaking, a company associated with him) obstructed in the 1990s. He was building a mansion at HIgh Cross and did not want footpaths near it. The land you see was obstructed by barbed wire, industrial containers and a farm building. It was patrolled by security guards. It is hard to believe now but it was the site of one of the more high profile campaigns that the ramblers fought, using newly acquired powers under the Countryside and Rights of Way Act. 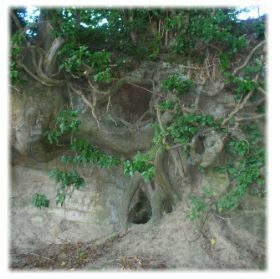 It was won despite the obstruction and inertia of East Sussex County Council, who could have taken action on their own. The photos you can see there were taken in this field. Here you can find the full story. It must be said that the vast majority of land owners do keep the paths on their land open, but at any moment in time, up and down the country, the Ramblers Association has a large number of cases like this that it is fighting. Some have gone on for many years. In this case you can now enjoy the fruits of that work. Was it worth the battle? The path itself is not particularly special, although there are lovely distant views of the south downs and a tranquil woodland walk to follow. But the impact has been tremendous. By taking on such a powerful adversary the Ramblers made it clear to others that they were prepared to defend the nations footpaths for everyone against anyone. Since the time of the case the state of footpaths in East Sussex has improved considerably. This is partly because of this case. Cross the field to reach a stile at the other end. Climb this and follow a footpath through fields and at wood, with the occasional stake with yellow paint on top and High Cross estate private sign on your right hand side. There are distant views of Mr Van Hoogstraten’s palace. Leave the High Cross Estate by climbing over a stile. Cross a field to a further stile straight ahead. Having crossed this you are now in a large field with no clear path. Try to head in the same direction as you have been travelling so far. When you reach the edge of the field turn right and follow the field edge to the end of the field, where you will find yet another stile. Cross this to enter something of a wasteland. The path continues ahead and then comes to 2 mounds. These are the remains of a dung heap that was thrown up across the path, obstructing it- another battle the Ramblers had to fight. The path still does not follow the legal route here. Aim to walk between the two mounds. Bear left on a faint path, which then joins a wider track. Turn right here. . There are large buildings to your left and what looks like an overgrown car park on your right. Keep slightly to the right alongside the edge of the overgrown car park to reach a footpath sign on your right. 7) This directs you slightly to the left, by a private play area and down a short flight of steps into a smaller and more modern car park. Cross the car park and then cross the lawn ahead of you, keeping the pond to your left. Aim for a gate ahead of you. The signage and steps round here were put in by East Sussex County Council following pressure from the Ramblers. Go through the gate and up the drive to the main road. This is the busy A22. Cross it carefully and turn left along the verge for about 100 metres. At the first turning, a farm track to the right, leading past a house, turn right. There is no footpath sign here, but there is a right of way. Pass the house and continue on the track through a metal gate. This is a lovely, almost forgotten, green lane. Who knows who has travelled down it in years gone by. You are unlikely to see anyone else on it, although it is clearly used. The footpath is well signed through the grounds. They do not want you wandering away from the route. Keep on a tarmac track, avoiding routes that turn off to the right. You pass in front of the resort and come to a little wooden building that is the half way house tea room (F). It is open every day throughout the year until 3 or 4 pm and has a little patio area as well as indoor seating for about 8 and toilets. Just after the tea room the right of way turns left on another tarmaced path and then right. Follow the path round the resort to pass close to one if its bar and lounge areas (smart casual dress only) . Bear left here. Shortly after this a sign directs you to leave the tarmac to the left down a track when heads towards a wood, plunges into the wood and then out again. You must then cross two fairways, walking straight ahead in the same direction as you were going when you passed through the wood. 9) Reach the Little Horsted primary school car park. You have a choice here. You can keep straight ahead and then follow the road to the right past the church. This brings you out at a bus stop where you can get buses to Uckfield, Tunbridge Wells, Lewes and Brighton. Or you can turn right past the school, though a gate and back onto the golf course. Once back on the golf course do not take paths to the left or the right, but continue straight ahead across a fairway, heading just to the left of a large tree in front of you. Pass some trees on your right and come to a tarmac path. Continue ahead on this path till it turns sharply round to head back on itself. Leave the path and head straight ahead. Bear slightly right to leave the golf course and walk along the edge of a field with a hedge on your left. 10) Come to a four way junction. Turn left on a bridleway through woods. Follow this to the main road. Cross the road. Turn left along the pavement for about 50 metres and turn right along a lane, signposted to Horsted Green. Continue along this lane for nearly a kilometre. It bends to the right. 11) Immediately after College Farm turn right along a track past Dicks Barn. There is no signpost, but this is a right of way. Turn right through a large metal gate, which may be open, and then left again to continue in your original direction, down the hill towards a gate and a bridge straight ahead of you. Cross the bridge and cross the busy Uckfield bypass. Walk left by the side of the bypass for about 50 metres. Before you are opposite the beginning of the layby on the opposite side of the road a faint footpath leads up the embankment to a stile. If you reach the layby opposite you have gone too far. Cross the stile and walk ahead up the hill aiming for the hedge at the point at which it passes to the left of some farm buildings. Look out for a stile in the hedge next to a water trough. Go over this and turn right alongside the hedge to the corner of the field. At the end of the field turn slightly right and then left through a metal gate. See a further metal gate on the opposite side of the track. Go through this and walk across the field ahead of you, aiming for the corner of a wood that juts into the field. Once you reach the corner walk ahead with the side of the wood on your left. In the corner of the field you will find a stile. Go over this and turn left on a path which joins a larger one in about 5 metres. This is Boothland Wood. Turn right and keep on this main path until you emerge from the wood onto a playing field. The path now turns right along the edge of the playing field and then left along the field next to the backs of the houses. A sign directs you down an alley to the right which brings you out into an estate road. Uckfield is now ringed with large numbers of estates like this which often have no facilities of their own, but are dependent on what exists in Uckfield town centre, which is still some way away. Turn left on the estate road and then take the first left. Follow this road to its end. You seem to be in a dead end but an alley on the right leads you to the main road and a bus stop. Buses stop here for Lewes, Brighton and Eastbourne, as well as to Uckfield bus station and Tunbridge Wells. Alternatively you can turn left and walk down the hill for about a kilometre to return to your start point. If you still have the energy, Uckfield is an old market town worth exploring. You can get more information about the town from the Civic Centre, near the car park. Amongst other things, it was the setting for the hilarious book called “Maximum Diner” which detailed one man’s attempt to set up a high class american burger joint in the town.